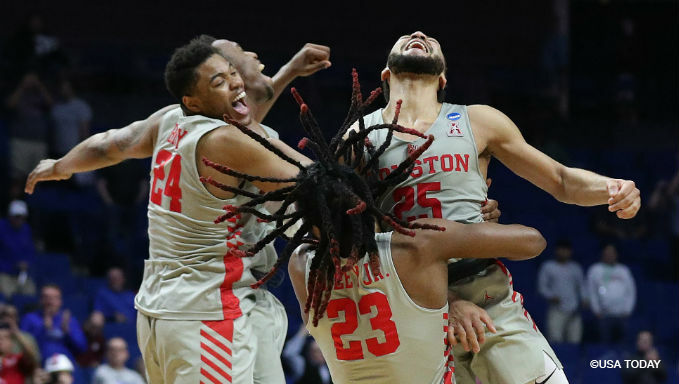 The Sweet 16 is here, and it’s a sweet one indeed for fans of college basketball betting: four No. 1 seeds, four No. 2 seeds, four No. 3 seeds and a pair of No. 4s. It’s been a decade at least since March Madness has seen regional semifinals this loaded, the product of early rounds that produced a number of close, entertaining games but not many straight-up upsets. For basketball fans, that’s a good thing — Thursday and Friday present some matchups worthy of the Final Four and a great two days of watching March Madness. But for college basketball betting fans, slates of power teams facing off against one another lead to narrow point spreads and difficult decisions. To help, here’s a betting guide to what could be the best round of this tournament. For all the hype around Duke and Zion Williamson and all the attention paid to the ACC producing three No. 1 seeds, no team in this tournament has looked better through two rounds than the Zags, who have been unchallenged to this point. 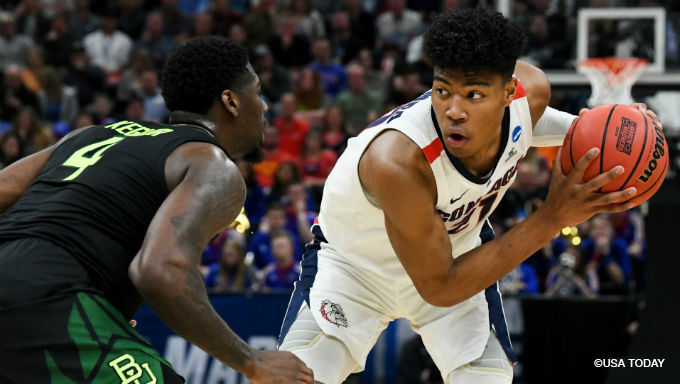 In a guard-oriented game, Gonzaga presents a tough matchup with its deep frontcourt of Rui Hachimura, Brandon Clarke and Killian Tillie, who thrive in an offense that moves at a breakneck pace. There was plenty of celebrating in the Tennessee locker room on Sunday, while everyone else was wondering how such a veteran team can play a white-knuckler against Colgate and then nearly blow a huge lead against mediocre Iowa. The Vols showed a real weakness for defending the 3-point shot in their close call against the Raiders, a deficiency that could prove lethal against a Purdue team that can fill it up from deep. There are no style points when it comes to Texas Tech, which simply grinds opponents into submission behind one of the best defenses in the game. That approach helped the Red Raiders somewhat easily dispatch two upset-minded darlings in Northern Kentucky and Buffalo, and cover 10 of its last 12. But nowhere in that span has Chris Beard’s team faced an opponent as good as the Wolverines, who feature elite on-the-ball defenders and quality size inside. They’ve been helped by a good draw and an upset on their side of the bracket, but the Ducks have earned it by winning 10 straight to become the only real surprise of the Sweet 16. That success has translated against the spread, where Oregon has also covered in every game of its winning streak. Virginia has hardly looked bulletproof, falling behind big to No. 16 seed Gardner-Webb before rallying to stave off panic, and failing to cover three of its last five. But Oregon’s defensive, somewhat plodding style plays right into the hands of a Virginia squad that commands tempo, and it’s hard to envision the Ducks pushing the Cavaliers out of their comfort zone. No head coach? 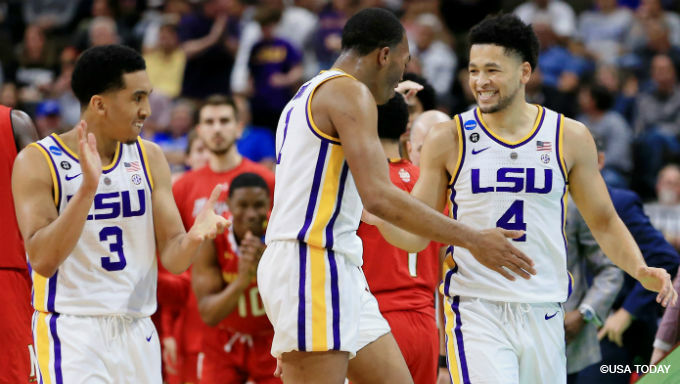 No problem for the cardiac Tigers, who continue to win close games even with Will Wade still suspended by the school for his alleged role in the game’s corruption scandal. Going to the final minute against Yale and needing a last-second shot to beat Maryland wouldn’t seem to inspire confidence against Michigan State, which has won seven straight and 11 of its last 12, and has covered 10 of its last 14. Auburn has elite talent, and the Tigers seem to finally be putting it all together with 10 straight wins capped by an absolute hammering of Kansas. Now comes the challenge of keeping it going against the Tar Heels, who are right up there with Gonzaga as far as the best team in the tournament so far. And yet, the Auburn that lost to a host of lesser lights in the regular season still rears its head from time to time, as it did in the final moments in the opening round against New Mexico State. So, what to make of the No. 1 overall seed nearly meeting its end to Central Florida in the second round? You rely almost exclusively on freshmen in the NCAA Tournament, you’re going to endure some heart-in-the-throat moments like we saw Sunday afternoon. UCF tried a strategy of making Duke players other than Zion, R.J. Barrett and Cam Reddish beat them, and none of the other Blue Devils were able to step up and make shots. The Wildcats won and covered in each of the first two rounds without injured forward P.J. Washington, who’s suffering from what’s being called a sprained foot. And yet, it seems more serious, given Kentucky’s best player has his left foot in a hard cast and told CBS he “heard a pop” before going down. Without him, a short Kentucky rotation gets even shorter, and the Wildcats rely further on their cast of excellent, defensive-minded guards.